It’s not often I say of books I’ve read that I wish they were longer. But that is exactly what I have to say about 84, Charing Cross Road. 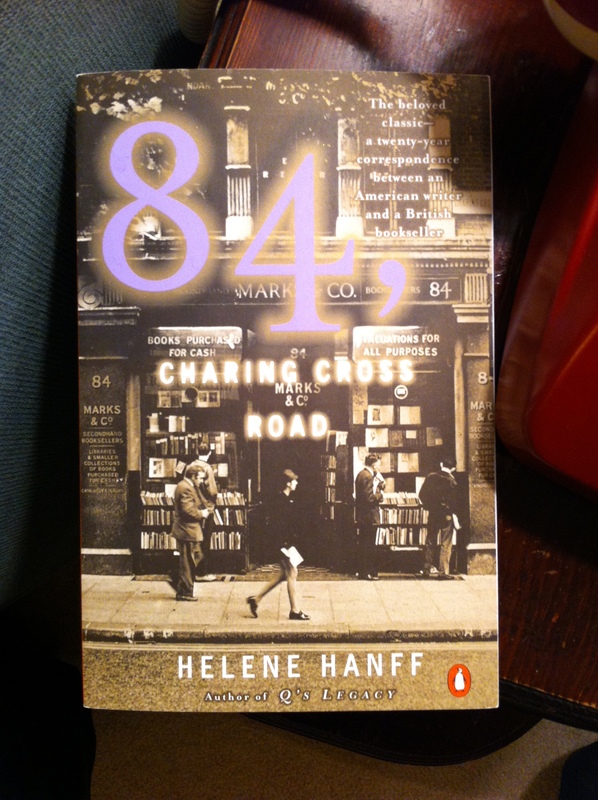 In this too-slim volume are the letters Helene Hanff, a struggling playwright in New York City, wrote to the Marks & Co. bookshop located at 84, Charing Cross Road in London, and the bookshop’s responses, mostly from one of their employees, Frank Doel. What starts as a business correspondence in 1949 grows into a real friendship, as Helene’s wit and enthusiasm eventually overcome Mr. Doel’s British reserve and politeness. When Helene hears (through her upstairs neighbor’s boyfriend) of the rationing still going on after World War II in Britain, she starts sending the occasional care package of food for all the employees of the shop, which leads to some quite funny exchanges. If you love books at all, it’s impossible not to appreciate Helene’s enthusiasm as she speaks of being “afraid to handle such soft vellum and heavy cream-colored pages” of some of the beautiful used books Marks & Co. sent to her, and how they shame her orange-crate bookshelves. Or how she was refusing to return her library’s copy of Pride and Prejudice until the bookshop could find copies for her. This book made me long for an age when retrieving one’s post meant more than getting a stack of credit card applications, catalogs, and adverts placed almost directly in the recycle or trash bins. So many of us have given up writing letters, instead relying on social media platforms to keep us in touch with our friends, and frankly, this book filled me with a sense of what we’ve lost. There’s so much we can say with the space and time of a letter that 140 character limits and internet attention spans deprive us of. Bottom line? I think you should read this book. You’ll laugh out loud, and I cried, too. And then maybe you should go write a friend a real letter. This entry was posted in Books, Reviews, and Reading and tagged books, Helene Hanff, letters, nonfiction on January 8, 2013 by ms.grammarian.